This progression technique is used when there is no collective protection (railing, protective nets, etc.) or when overhanging structures or worksites do not allow for mobile platforms, outdoor scaffolding, etc. to be used. This is also the case for temporary operations where it is not practical to set up collective protection. The work area is accessed with ropes by operators specialized in rope access techniques. A site can be accessed from the top (safer and simpler to set up, this is the technique of choice), or from below (for example, a leader throws a rope up and around a fixed point, and then climbs up the rope, or he uses mountaineering progression techniques). Once the leader has installed all the progression and safety ropes, the other workers can safely climb up these ropes. 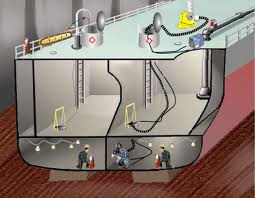 Work done in confined spaces carries specific additional difficulties related primarily to the lack of space and to the lack of means of autonomous progression. Besides, the worker may face numerous additional constraints: length of the intervention, air quality, temperature, etc. Since he cannot move about or ensure his own safety, someone working in this type of environment must have assistance. Confined spaces are generally accessed from the top. The worker’s safety is ensured by a reversible hauling system, which is independent and reliable, allowing a quick evacuation in case of an accident.